ZBE’s WorkStream Suite offers “workflow delight”. It is professional software that offers worry-free, efficient and accurate preparation, control and automation of digital print production from the photographer’s studio and in the photo lab. WorkStream coordinates the entire process of order creation, receipt, color correction, cropping and retouching, scheduling, printing and customer interface. It provides tools to photographers for easy, efficient and accurate order preparation and ordering. It gives the lab seamless order management, enhancement, print scheduling and production capabilities. It also offers easy capabilities to the lab for new digital product creation and use. ZBE WorkStream Suite is comprised of independent, yet integrated, products. for imaging lab customers and the photographer’s studio. 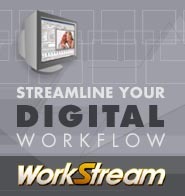 WorkStream IA (Imaging Automation) manages the production process in the digital photo lab or imaging service bureau. WorkStream IA handles all aspects of order creation, management and production from order creation and scanning, through color correction, cropping and retouching, to scheduling and printing. IA also can be provided with a rendering engine, Workstream RE, to create, render and distribute completed orders of printer-ready files to any RGB printer. WorkStream RE provides valuable multi-printer workflow integration for using WorkStream’s broad print production, packaging and customer interfacing capabilities. Easily receive or create orders. The process is fast, intuitive and precise. Enter the order elements desired including image product selection, package and print selection, onscreen cropping, rotating, retouching, resizing, quantity, composition and color correction. Identify any cited customer preferences. As needed, correct the color profiles. To enter a customer orders, simply select an entire folder. It’s fast and easy. Specify which of the images will be printed. Cite the “products” or packages to be produced for each of the images. Products are clearly outlined in the “Products Window”. There are standard prints, package prints and custom sizes. Manage the images without worries or difficulties. ZBE WorkStream IA allows you to efficiently receive, organize, manage and archive image files. These are integrated in to order histories and other databases. Manage the images using resizing, cropping, zooming and rendering capabilities. Track orders for confidence and urgency. Images are viewed as thumbnails. You can adjust to the size and quantity of the thumbnails displayed on the screen to your preference. Cropping on-screen is very fast and easy. By double-clicking, the image opens full-screen. You can crop by dragging the crop box into the desired position. Double click again, and move on to the next image or, simply click the arrow button to bring up the next image in the file. WorkStream IA software allows “on-screen soft proofing” for the entire order. WorkStream provides you “VCNA” style controls and uses ZBE’s “ColorPro Rapid Color Input Device” for adjusting the color balance of your image. As you adjust the color controls, the color balance will change on your monitor. With an ICC profiled monitor, what you see (on the screen) is what you will get on the finished print! You can perfect the color, density, contrast and saturation across a group of images simultaneously. You will get great results with total ease and confidence. WorkStream IA supports the retouching of images at the click of button. Open the image that you want to retouch. Click on the “Retouch” button to open the image in Photoshop or whichever retouching program you use. The altered image will be transferred back to WorkStream. It will be ready for printing. Workstream IA with its WorkStream RE component allows you to create, render and distribute completed orders of image-ready RGB TIFF, JPG and BMP files to any digital printer. Issue the order for printing from any workstation on your network. Schedule the orders by priority. Final purposed files can be delivered to any specified hot folder. Enabling easy integration with most digital print production, packaging and customer interfacing capabilities. Monitor the order stats throughout the production process for confidence. WorkStream DS (Digital Studio) runs in the photographer’s studio. WorkStream DS is used to prepare images and orders that will be printed at the photo lab. All aspects of the order can be entered by the photographer, including image color corrections, cropping and composition, retouching, and product selection. WorkStream DS automatically generates an order archive and database for your studio. Orders prepared in WorkStream transfer seamlessly to your photo lab for automated production. Make up orders easily. Enter the order elements desired, including image product selection, package and print selection, onscreen cropping, rotating, retouching, resizing, quantity, composition, and color correction. To enter a customer’s orders, simply select an entire folder. Specify which of the images will be printed. Cite the “products” or packages to be produced for each of the images. Products are clearly outlined in the “Products Window”. There are standard prints, package prints, and custom sizes. Manage the images without worries or difficulties. ZBE WorkStream DS enables you to input, organize, manage, and archive image files. Integrate them into your customer database. ZBE WorkStream software also allows “on-screen soft proofing” for the entire order. As you adjust the color controls, the color balance will change on your monitor. With an ICC profiled monitor, what you see (on the screen) is what you will get on the finished print! You can perfect the color, density, contrast, and saturation across a group of images simultaneously. You will get great results with total ease and confidence. WorkStream DS supports the retouching of images at the click of button. Open the image that you want to retouch. Click on the “Retouch” button to open the image in Photoshop or whichever retouching program you use. The altered image will be transferred back to WorkStream. A. WorkStream is professional software that offers worry-free, efficient, and accurate preparation, control, and automation of digital print production from the photographer’s studio and in the photo lab. WorkStream coordinates the entire process of order creation, receipt, color correction, cropping, and retouching, scheduling, printing, and customer interface. Q: What are the benefits of WorkStream? A. WorkStream provides tools to photographers for easy, efficient, and accurate order preparation and ordering. It gives the lab seamless order management, enhancement, print scheduling, and production capabilities. It also offers easy capabilities to the lab for new digital product creation and use. Q. WorkStream Suite is comprised of independent, yet integrated, products. What are they? What do they do? A. WorkStream IA (Imaging Automation) manages the production process in the digital photo lab or imaging service bureau. WorkStream IA handles all aspects of order creation, management, and production from order creation and scanning, through color correction, cropping and retouching, to scheduling and printing. WorkStream IA also can be provided with a rendering engine component – WorkStream RE – to create, render and distribute completed orders of printer-ready files to any RGB printer. This component provides valuable multi-printer workflow integration for using WorkStream’s broad print production, packaging, and customer interfacing capabilities. A. Digital photo labs covering many market segments and imaging service bureaus use WorkStream IA to manage their production process. WorkStream IA handles all aspects of order creation, management and production from order creation and scanning, through color correction, cropping and retouching, to scheduling and printing. Customers of photo labs use WorkStream DS (Digital Studio) to prepare their orders. Using WorkStream DS, photographers can do all aspects of order creation. These include selecting products, creating packages, choosing print sizes, scanning, retouching, correcting colors, cropping, applying logos and watermarks, and creating composite products including greeting cards and composites. Even without creating orders, WorkStream DS (Digital Studio) includes powerful image viewing, editing, archiving, and management tools. Q. What printers does WorkStream IA work with? A. WorkStream IA works with ZBE Chromira printers. With its rendering engine component, WorkStream RE, it seamlessly creates, renders, and distributes completed orders of printer-ready files to any RGB printer. This component provides valuable multi-printer workflow integration for using WorkStream’s broad print production, packaging, and customer interfacing capabilities. Q. Do I need WorkStream IA to print with the Chromira? A. No. Chromira printers and labs easily function with all popular workflow applications to meet your digital production and workflow. They include: Fuji PIC, Kodak DP2, Express Digital, ROES, Labtricity, Frontline, WorkStream, etc…. However, WorkStream provides many time-saving features and functions that can improve your productivity and business versatility. Q. Does WorkStream IA replace the original ZBE Chromira WorkStation software that runs the Chromira? A. Yes. WorkStream provides all the functions of the Chromira Workstation software, and many, many more capabilities. Q. Does WorkStream IA install and run on my Chromira? A. No. WorkStream IA is designed to operate on a networked computer. Q. Are there any restrictions on print size? Q. Can I do re-touching utilizing WorkStream? A. Yes. WorkStream connects automatically to your Photoshop software, or other imaging software. Click the “Retouch” button in WorkStream. The image is automatically opened in Photoshop. You’ll have all the tools of Photoshop at your disposal. When you’re finished, the image will be automatically reloaded in WorkStream. Q. Does WorkStream come with Photoshop? Q. Does WorkStream do “order entry”? A. WorkStream is not an accounting and “order entry” system. WorkStream controls the actual creation, productionm, and printing of the orders in your lab. Consequently, the “production” details of the order are entered through WorkStream IA. The financial details do not change from your current system. Q. How does WorkStream integrate with my current order entry software? A. WorkStream runs independently from your current order entry software. Q. Does WorkStream maintain order histories? Q. What kind of computer specification do I need for WorkStream? Q. Does WorkStream allow me to make design custom packages? Q. Can I add text to my images? Q. Can I create sports packages or other templates with WorkStream? Q. I want to buy a Chromira printer. Will WorkStream IA come with it? A. Two “seat” licenses of WorkStream IA are included with your Chromira Premium Maintenance contract and will be renewed with your maintenance. If you elect to discontinue your Chromira Priority maintenance contract, your WorkStream seats expire but may be renewed, or you can add additional seats separately from the service contract for $995 per seat, per year. Q. Will WorkStream IA support my scanner? A. WorkStream will support scanners, which conform to the “Twain” standard interface. “Twain” is the standardized interface used on scanners so most scanners use it. Note: Some scanners are equipped with long roll film drives. In some cases, the long film drives themselves do not conform to the “Twain” standard although scanner does. It means that the scanner conforms to the Twain standard when used to scan single frames, but not when used to scan multiple frames. Q. Will WorkStream IA work with Kodak HR500 or 3570 scanners? Q. Will the prints match my monitor? A. Yes. WorkStream provides on-screen “soft proofing” utilizing calibrated monitor and ICC profiles for your printer. Q. How do I color manage with WorkStream? A. WorkStream IA and DS provide “live color management” capabilities. WorkStream IA: This provides the lab with “VCNA” style controls for adjusting the colors of images. As you adjust the color controls in WorkStream, the image colors will change on the monitor. Since WorkStream employs color management and “Soft Proofing”. WorkStream IA also provides “VCNA” style controls and uses ZBE’s ergonomic “ColorPro Rapid Color Input Device” for adjusting the color balance of your image. As you adjust the color controls, the color balance will change on your monitor. With an ICC profiled monitor, what you see (on the screen) is what you will get on the finished print! You can perfect the color, density, contrast and saturation across a group of images simultaneously. You will get great results with total ease and confidence. Q. Will WorkStream IA take numbers from my video analyzer for color corrections? A. With WorkStream, you will no longer use your video analyzer. The traditional video analysis functions are now performed with WorkStream, using a calibrated monitor. Q. Does WorkStream IA allow a lab operator to color correct images just before I send then to print, or do I need to correct them beforehand? A. Either… the choice is yours. WorkStream allows the ultimate flexibility for your workflow. You may enter, crop and color correct the order in sitting. Or if you prefer, WorkStream fits an assembly workflow process where one person enters order, another person crops, and yet another performs color corrections. Q. What file types will WorkStream IA handle? A. WorkStream can handle TIF, JPG, and BMP files. Q. Which RIP is needed for WorkStream? A. WorkStream does not require any specific RIP. Any RIP that generates a TIFF, JPG or BMP file can be used. Q. How does “Soft Proofing” work using WorkStream? A. WorkStream IA displays your images on the monitor so that they visually match the colors of the image, as it will print on paper. This allows you to perform color corrections on the monitor and be confident that the colors on the final print will match. Q. What Color management software can I use with WorkStream? A. WorkStream is compatible with any color management software that generates “ICC Profiles”. (This is pretty much ALL color management software.) ICC Profiles are the industry standard method of describing the colors of printers, monitors and image files so that they will print correctly. Q. Can WorkStream keep track of my customer base and their orders? Q. Can I have a single license of WorkStream IA software to utilize all of the features? A. Yes. If you have a single computer that handles all job creation, color correction and retouching and printing, that’s all you’ll need. If you wish to have others in your lab perform specific parts for each job, each computer will require a license of WorkStream IA. Q. What User training does ZBE offer with WorkStream IA for my lab? A. WorkStream comes with animated tutorials which demonstrate WorkStream’s intuitive features and easy operation. There is also a manual in PDF format packaged with the installer. Materials are also available through the website. Q. Will WorkStream IA support my existing Cutter? A. Support for various cutting options is done by a particular printer (like the Chromira). Q. Will WorkStream IA support my existing digital printers in addition to a Chromira? A. WorkStream IA also can be provided with a rendering engine component, WorkStream RE, to create, render and distribute completed orders of printer-ready files to any RGB printer. Q. I don’t have a calibrated monitor. Can I still do video analysis with WorkStream IA? A. No. You need to calibrate your monitor (and your digital printer) in order for your monitor to accurately reproduce the colors, as they will appear on the prints. Q. How do I get support for my copy of WorkStream? A. Labs can obtain support for WorkStream IA through the ZBE website, email, or by phone to ZBE. Photographers receive support for WorkStream DS through their lab partners. Q. Are WorkStream screen layouts customizable to meet my special needs? A. Yes. WorkStream screen layouts can be customized. Custom products or print packages can also be created. Q. Is WorkStream DS free to the photographer? Click the link below to download the installer.